Named after a divine plant venerated by ancient human societies, Haoma brings to Bangkok an exquisite Neo Indian cuisine, elegant ambiance, together with a relaxed atmosphere. Among Haoma's core values is a deep respect for nature. We strive to create the best flavors from what's available in our surroundings. We cook what we love." We try to bring the freshest organic Thai ingredients and produce and high quality sustainable meats to your plate, bringing together the impeccable flavors and plate presentations inspired by Chef DK`s Indian roots like never before. We serve the finest selection of Sustainable, Organic and Bio-Dynamic wines sourced tastefully from the finest wine producers across the globe. If cocktails are your thing, you'll love Haoma's reimaginings of old classics. 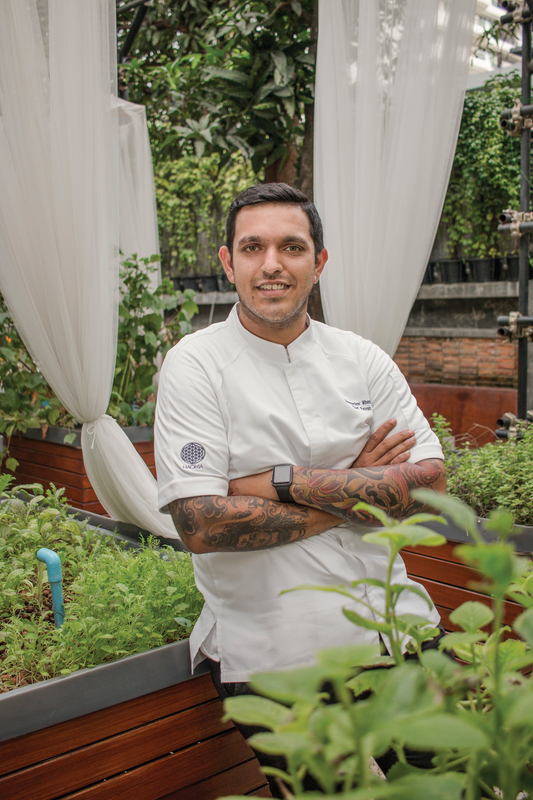 Chef Deepanker Khosla is both the engine and the pilot of Haoma's passionate endeavor to become a pioneer in sustainable fine-dining. His cuisine is focused on locally sourced quintessential ingredients, with an emphasis on simplicity, purity, and seasonal flavors. Chef Deepanker can be found here every day, working the soil, planting, weeding and harvesting the finest herbs and vegetables so that his guests can enjoy the freshest ingredients possible.